21 Items. Showing Items 10 thru 18. 34 3/4” x 61 3/4” French language poster for Niagara (1953) Niagara was a Technicolor film noir that helped to solidify Marilyn Monroe’s status as a box office draw. This poster was issued for a 1970s re-release. Folded. Some splits at folds. Overall Fine. 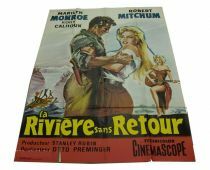 45 3/4” x 61 1/2” French language poster for River of no Return (1954) River of No Reutrn was a successful western that starred Robert Mitchum and Marilyn Monroe. This poster was issued for a 1960 release. Folded. Some separation at folds. Overall Fine. 18 1/2” x 26” U.S. Treasury Poster. U.S. Government Printing Office. 1948. 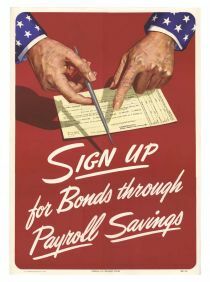 Image of Uncle Sam’s holding out a pen and pointing to a Pay Roll Savings Form. Text reads: “ Sing Up for Bonds through Payroll Savings.” Folded in quarters. Small pinhole at intersection of folds. Overall Very Fine. 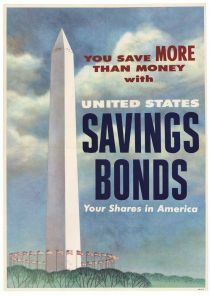 18 1/2” x 26” U.S. Savings Bonds Poster. No printer or date identified. Image of the Washington Monument surrounded by American flags. Text reads: “You Save More Than Money with UNITED STATES SAVINGS BONDS Your Shares in America.” Folded in quarters. Minor separation at edges of folds. Overall Fine. 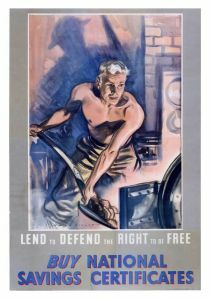 20” x 29 3/4” poster, “Lend to Defend the Right to be Free - Buy National Savings Certificates.” Image of a worker shoveling coal into a furnace. Printed for H.M. Stationery Office by J. Weiner Ltd London W.C.I. Issued by the National Savings Committee, London, Scottish Savings Committee, Edinburgh” Unfolded, small edge chink at extreme left margin. Light surface stain at left margin. Overall very fine. 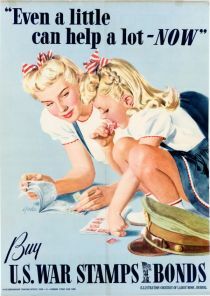 [World War II] 1942 War propaganda poster: “Even a little can help a lot - NOW Buy U. S. War Stamps and Bonds. Illustration courtesy of the Ladies’ Home Journal.” By Al Parker, famous and pioneering illustrator and founder of Artist School. U.S. Government Printing Office. Original folds, with 1” clean fold separation on bottom fold, top has minor remnant of being taped up. 14” x 19½”. Fine. 29 3/4” x 19 1/2” poster, “Leaders of the Royal Air Force.” Portraits of sixteen high ranking members of the Royal Air Force with blue sky in background. Royal Air Force insignia at top center. “British Information Services 30 Rockefeller Plaza” stamp on verso. This poster was printed to honor the leaders of the British Air Force during the Battle of Britain. Paper loss at top edges. “Lead” of “Leaders” not intact. Overall very good. 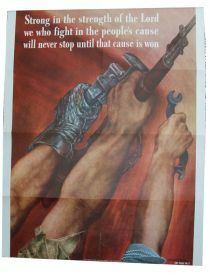 22” x 28” poster, “Strong in the strength of the Lord we who fight in the people’s cause will never stop until that cause is won.” Image of the hands of two workers, each holding a wrench, and a hand of a soldier holding a rifle. OWI Poster No. 6 U.S. Government Printing Office 1942. Usual folds, split at bottom center fold. Small tear in the lower portion of the poster in the soldier’s arm. Overall very fine. 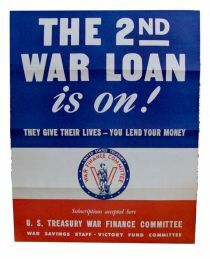 22” x 28” poster, “The 2nd War Loan is on! They give their lives - you lend your money.” War Finance Committee emblem at lower center. Usual folds. Overall very fine.